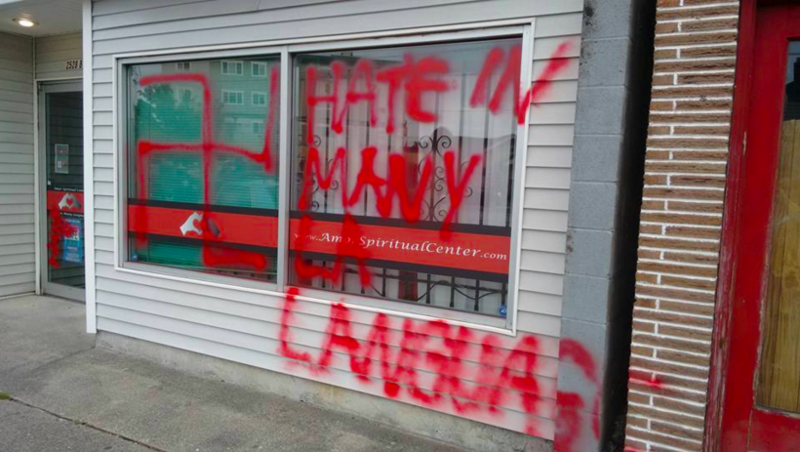 When neighbor Callista Chen posted the above picture to the Facebook group Beacon Hill Social Club, neighbors rallied to denounce the graffiti and offer to help clean up. Later on Wednesday, second- and third-grade students at Beacon Hill International School sent artwork and messages of support to decorate the Amor building. Though one or two people posted comments blaming “gentrifiers” for what happened, most neighbors in the Facebook group avoided the temptation to use this event to add divisiveness to the community. Gentrification certainly is an important topic, one that should be discussed, but it seems unlikely that affluent new residents go around tagging Beacon Avenue buildings in between shifts at Amazon. The people at Amor have scheduled an Amor Love Circle Event for this Sunday, October 25, from 12 noon to 1 p.m. “Join us to create a Love Circle on Beacon Hill. It is time for us to transform all the hatred, bigotry, and racism with our love. We have tried countless other ways; let us now choose love.” All are welcome. Wendi, knew you from the days when you were the fifth Beatle. Gotta get me a ukulele. Hope you’re doing well. Anyway, please consider connecting your blog to others in the Seattle area. Swap ideas. Maybe there is a way to get it funded. Check out MapleLeafLife.com. Our neighborhood blog profiles mostly lost and found, crime, weirdness, and new businesses.